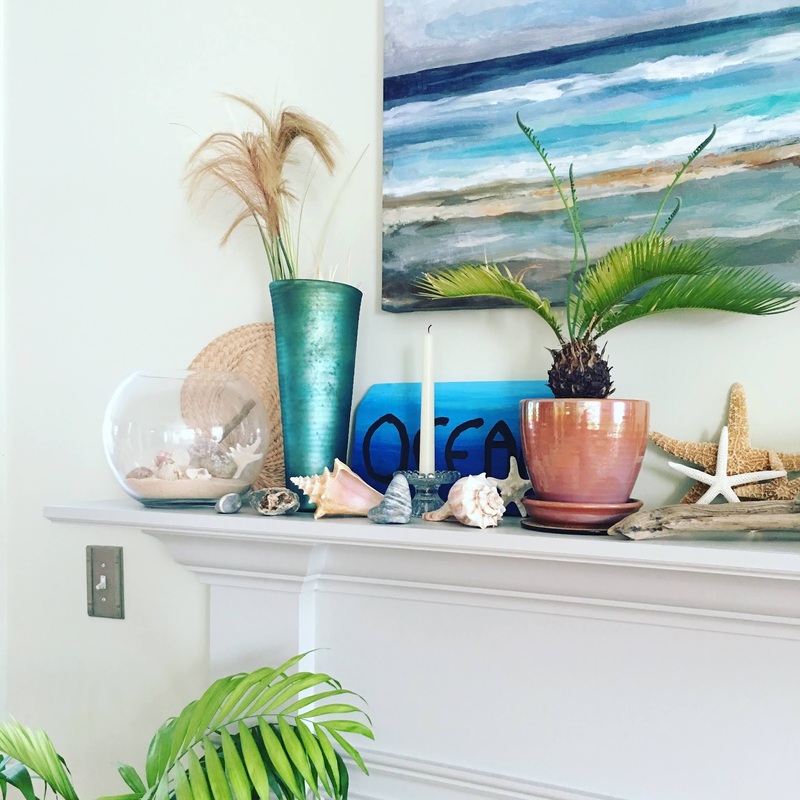 All this gloomy rain has me looking to the beachy cheerfulness of my mantel. Ok rain, that’s quite enough, let the sun return to dry us all out. The Sea green Portifino vase and painting are from Homegoods. I found the fan and clear bowl vase from Michaels. I filled the bowl with sand from Virginia Beach as well as some seashore finds from vacations. Shells and starfish were gifts from friends, seashore rocks from Maine, and driftwood from Rhode Island. The ocean plaque was made by my daughter. The little palm fern was a $1 buy from Lowes that I have brought back to life. I found a taper candle to put in a Partylite candlestick holder. Below the mantel is a 40+ year old palm plant that my mother gave to me because she was killing it. I've had this palm for about 20 years. This was a shoot from the original plant in my Granny’s dining room. That original palm was a 5’ Beast!